Downtown is at its best this time of year with a buzz of activity—everyone wants to be outside. So take a long lunch or knock off early to check out some of the new food and drink options that have popped up around Market Square over the past few weeks—and meet some of the new vendors at the farmer’s market. Prosciutto & arugula pie at Pizzuvio. Photo by Matt Dayak. Eat: Pizzuvio – 268 Forbes Ave.
Ron Molinaro, of Il Pizzaiolo fame, opened Pizzuvio as a more casual, street food approach to Neapolitan fare. The dough is made in-house using the traditional Sicilian recipe that includes only flour, yeast, salt and water—no olive oil. The result is a lighter, softer crust. Mozzarella cheese is made fresh and stretched right there in the kitchen, and the red hot wood-fire grill makes for a nice bit of char on the crust. If there’s such a thing as a “summer pizza” this might be it—fresh, tasty and a little lighter. 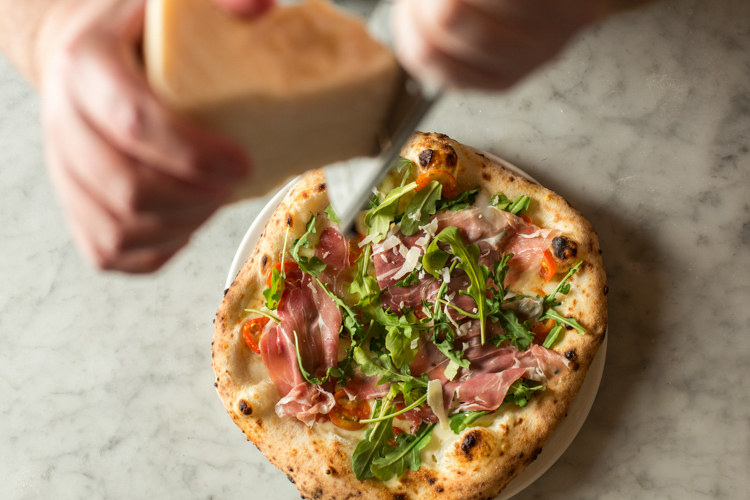 In addition to the classics, the menu offers specialty pies like the prosciutto & arugula, sausage & rapini, and the unique “Pizzuvio,” which is a half-calzone, half-margherita pizza. Keeping with the street food theme, there’s a range of “fritti” (fried, but sounds better when you say “fritti”) options. This includes arancini with different cheese and meat combinations, croquettes of potato and ham and montanarine, which is fried dough with mozzarella, romano and tomato sauce). While Pizzuvio is open in the evening and works for a nice dinner in an attractive setting, it’s a solid choice as a daytime destination. The easy-to-carry options work for creating a movable feast to take to your own special people-watching spot outside. 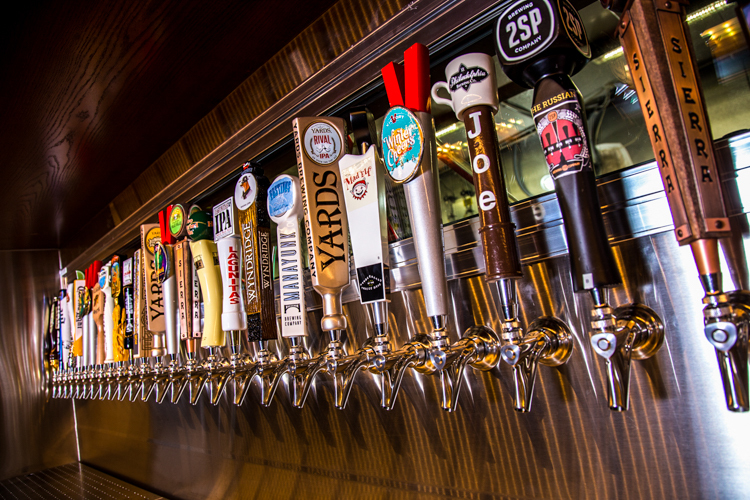 Beer taps at City Works Eatery & Pour House. Photo: Bottleneck Management. Recent Downtown addition City Works is big. There’s ample outside shaded patio space with a Market Square view conducive to enjoying cold brews on a hot day. It’s an easy meet-up spot for weekday happy hours (4 – 6 p.m.) and before and after Pirates’ games. The 90+ craft beer list regularly dedicates 25 percent of its taps to Pittsburgh brewers so there’s always something local ready to serve. Beer options include a diverse range, and bartenders offer tastings to help you. Bottleneck Management, the Chicago-based restaurant group that started City Works, makes Goose Island a regular in the tap line. They’ve also collaborated with Goose Island on a beer called Bottlenectar: a really refreshing pale ale featuring a German hop variety called Huell Melon—perfect for long summer days. It’s not all about beer, however. There’s a full cocktail menu with specialty mules and whiskeys, and a big wine list. So many choices means you need a “Cheesecake Factory” size menu, which they have. While our focus here is a great place for drinks, there’s also a generous menu of bar bites, shareables, burgers and entrées. Meaning, once you settle into this drinking spot, you won’t have to leave for a while. 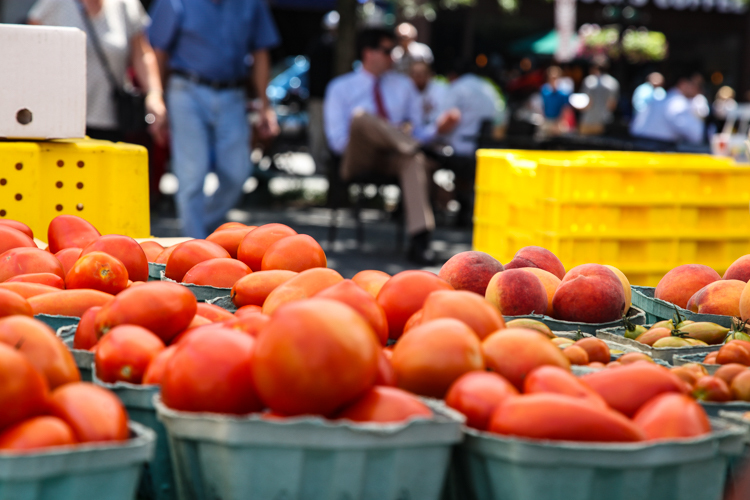 The Downtown Farmer’s Market begins its 13th season May 11th and will be held every Thursday from 10 a.m. to 2 p.m. With more than 5,000 people attending every week, there’s always a higher energy level Downtown on Thursdays. The Pickled Chef – seasonal pickled produce, condiments and sauces including sauerkraut, kimchi, dill pickles, beets, okra, hot sauce and more. The list of more than two dozen vendors returning this season includes: Simmons Farm, Woolf Farms, Gosia’s Pierogies, and Batch (homemade jams). Organizers are optimistic about another successful farmer’s market season Downtown. 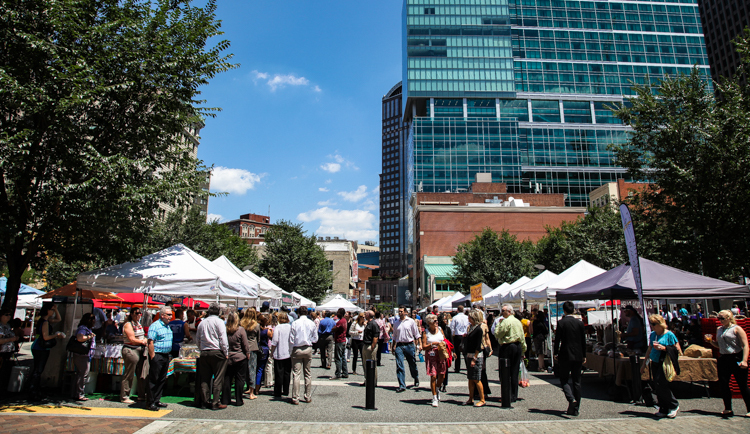 “The Market Square Farmers Market is the capstone of our Market Square programming. 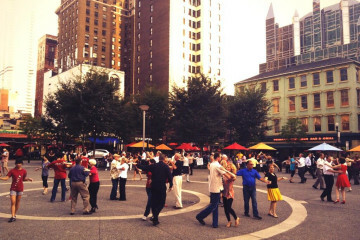 We look forward to bringing fresh produce, artisan foods, flowers, entertainment and much more to visitors to the heart of Downtown.” says Jeremy Waldrup, president and CEO of the Pittsburgh Downtown Partnership. Additionally, plans will be announced shortly for a weekly Saturday Night Market in Market Square beginning May 13th and running through October 28th. It will be more arts and crafts oriented like the night markets that have taken place during the Cultural Trust’s Gallery Crawl, but will feature a few of the farmer’s market vendors as well. 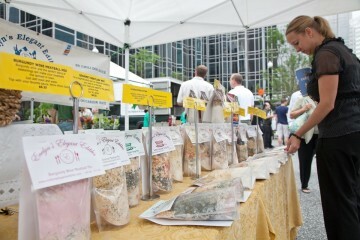 For more information about additional Pittsburgh area farmer’s markets, go here.